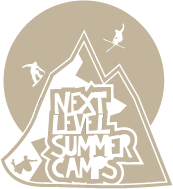 Why attend the Next Level Summer Camps at Liberty Snowflex? We are a coaching focused summer camp with some of the best coaches from all over the east. During the first night of each camp session our coaching staff hangs out around the mountain to watch campers ride. Campers are then split up into Beginner, Intermediate and Advanced freestyle groups at the end of the night based on their abilities. Each morning campers will shred different areas of the hill with their coaches and group to ensure that they ride a variety of features and jumps each day with riders of similar ability levels. For most skiers and boarders in the Midwest and on the East Coast summer shredding (aside from sketchy backyard setups) is just not in the budget. The summer snow setups that the Woodward, High Cascade and Windells camps have are all rad but just a little bit too far away and all those travel expenses add up. Come check out the year-round slope that southeastern skiers and snowboarders have been shredding for years! Snowflex Synthetic Slope - This surface is consistent and has a 2 inch layer of padding underneath which allows our campers to quickly learn new tricks while decreasing the impact of falls. Variety of Interchangeable Rails - Looking to work on your jib game? We've got kinked rails, elbow rails, c-rails, corrugated pipes, up-boxes, waterfall boxes, battleship boxes, floating tubes, etc... The list goes on and on! Jumps for All - Looking to go big on the jumps? We've got three main jumps including a knuckle, 10 foot kicker, and 20 foot kicker for safely getting comfortable in the air. Olympic Trampoline + BagJump Airbag - Looking to do your first flips and corks? Our Olympic Trampoline has both Ski and Snowboard Addiction training skiis and boards to get comfortable on; additionally, our BagJump Airbag will be open at limited times for safely getting used to going upside down. Coaches wake up the counselors to take them to breakfast and get them stoked on a morning of shredding! During breakfast coaches hangout with their group and throw down some ideas for how the morning coaching session will go. Each morning the different coaching groups will spend roughly 45 minutes on the rope tow, upper rails and jumps to ensure a variety of coaching experiences. During lunch counselors hangout with their groups and go through the plan for freetime activities that day. Bouldering at the Lahaye Rock Wall, hiking to Camp Hydaway and skateboarding at the Liberty Mountain Skate Park are just some of the many options for campers during freetime. Over four hours of shredding with various competitions and events mixed in. This is when campers can take laps with their coaches and friends in a relaxed environment. The Olympic Trampoline will also be available for campers to use at this time as well as limited use of the BagJump Airbag.